Believe me, I've got a nose for a good movie, and this one stuffs my nostrils. Clint is still busy chasing skirt and, at age 67, it might thrill the grannies in the audience, but others will wonder what it is that makes him more appealing than, say, a Brad Pitt, a Johnny Depp, or even a Viggo Mortensen. Nevertheless, let's get on about the "True Crime" which is the substance of the movie. © 1999 by Warner Bros.
3) the film has to have a story that will last through more convolutions. Everett is a damned good reporter, and he knows he's on to something when he finds out that they moved the potato chips. His relentless pursuit of the truth winds up making him view life once again through an alcoholic haze where (who knows?) he might find an answer. Time is his enemy, however (although you might not think so to look at the women around him), and he only has 24 hours to save the life of a (possibly) innocent man. Will our hero succeed? Will the dead-man-walking be pumped up with more than volume? Will justice prevail? Will Christmas be a holiday this year? This is Eastwood's 21st film as director (in his 41st starring role) and, although it will probably be a financial success, is of a much lower artistic caliber than something like "Bird," "Midnight in the Garden of Good and Evil," or "The Bridges of Madison Country." One wonders, considering he has such talent in so many ways, why he bothers with this kind of material. 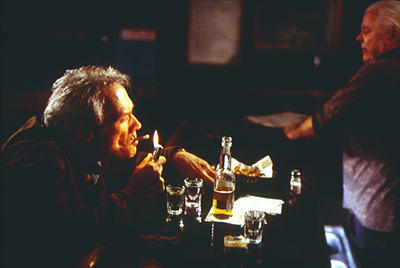 If this kind of Eastwood movie fare continues, he might wind up as the Truly Unforgiven. On the other hand, one could also easily view it with the response offered by the end- credits song: "Why Should I Care?" In the meantime, where's my favorite crayon?